If you have purchased your puppy from a registered breeder, you will have received a vaccination card in your puppy gift pack that says the puppy has been vaccinated at 6 weeks of age with his temporary vaccination. 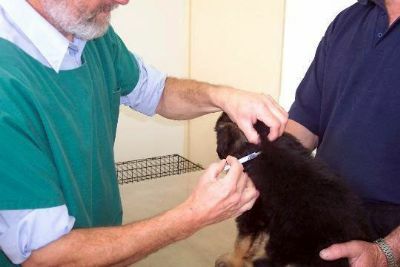 You will see that the next vaccination is due when the puppy is 12 weeks of age.Your puppy/dog will then be vaccinated a year later (at approx 15 months of age). After this vaccination at approximately 15 months, some veterinarians advocate vaccinating every 3 years. Be advised by your qualified veterinary surgeon as to what vaccinations your puppy/dog needs. Puppy Vaccinations - With the superior vaccines we use, puppies 10 weeks and over now only need a single C5 vaccination. Booster injections will not be required until they are over 14 months old. This vaccination covers distemper, hepatitis, parvovirus, bordetella bronchiseptica and parainfluenza 2 – canine cough/kennel cough. The best part is that the pups can be socialised (allowed out for walks and playing with other dogs) much earlier – allowing a more normal social development. Adult Dog Vaccinations - The triennial C5 vaccine given at our veterinary clinic covers for distemper, hepatitis & parvovirus for 3 years, and covers the bordetella bronchiseptica and parainfluenza 2 (canine cough/kennel cough) for one year. The heartworm injection (proheart SR 12) also covers your adult dog for one year.